Who is Peter Warlock? The name is probably not familiar to you, even if you are a self-proclaimed classical music buff. The short answer is Peter Warlock is Philip Heseltine. Born in London in 1894, Heseltine was a music critic (and a combative one at that), editor, and founder of the musical journal The Sackbut. His critical writings were all listed with his given name, but he took on the pseudonym Peter Warlock for his music compositions. Keep reading and you’ll also see, this wasn’t his only pseudonym! Why the name Peter Warlock? As a music critic, Heseltine had become known as a controversial figure, regarded with suspicion and hostility in the London music circle. So in 1918 when he sent seven recently composed songs to a publisher, he used the pseudonym Peter Warlock. The name is said to have originated from his involvement and interest in the occult. Unlike many well-known composers, Peter Warlock was not formally trained in the area of music composition. He was largely self-taught, but he received encouragement from fellow English composers like Frederick Delius. His body of work consists mainly of songs for solo voice and piano and song cycles (150 of them) like The Curlew and Candlelight, but his Capriol Suite, in particular, stands out and remains his most popular composition. The Capriol Suite is a set of dances originally written for piano duet. Warlock later scored it for both string and full orchestras. Written in 1926, it was based on tunes in Renaissance dances and in today’s world would be recognized as a sort of “throwback” piece with a few modern harmonies incorporated. It isn’t surprising that he would be inspired to write in an early English music form. Over his lifetime, he made well over 500 transcriptions of early works including compositions from Henry Purcell, John Dowland, and Thomas Ravenscroft. Though the work has six movements, it only takes about 10 minutes to perform. Be sure to check out our performance of it on February 23! Warlock’s music generally well-received by the public and critics. 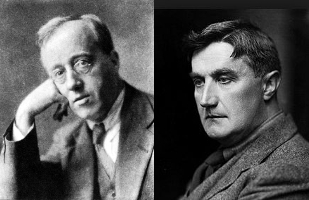 Ralph Vaughan Williams was reportedly “delighted” with the reception of Warlock’s Three Carols which Vaughan Williams conductor in 1923. Heseltine/Warlock conducted a performance of the Capriol Suite in August 1929 – the only public conducting engagement of his life. The audience recalled him four times after that performance. The legend of Peter Warlock is surrounded by controversy and rumor. In addition to his combative and argumentative nature and his interest in the occult, he was said to have experimented with a variety of unconventional practices including cannabis tincture and flagellation. He was also said to enjoy composing obscene limericks and he even edited an anthology in praise of drinking under a new pseudonym, “Rab Noolas” which is “Saloon Bar” backwards. Although the early 1920’s, particularly 1925-1929, were a fruitful time for Warlock, he found his creativity waning in 1929. Life became even bleaker in 1930 when there was little demand for his songs and he turned to music criticism and transcription again to support himself. He suffered from severe depression and in December 1930, he was found dead in his flat from gas poisoning. The coroner determined that there was insufficient evidence on whether it was suicide or an accident. His life has inspired numerous characters in both literature and film. D.H. Lawrence based his character, Julius Halliday, on Warlock in the novel Women in Love. Warlock also inspired characters in Aldous Huxley’s Antic Hay and Jean Rhys’ short story “Till September Petronella”. His life was depicted in the films Voices From a Locked Room and Peter Warlock, Some Little Joy, although it was highly fictionalized in the former. In 1963, the Peter Warlock Society was created and interest in his works began to increase. While some music experts acknowledge that his music today is often regarded as “programme filler” and encore items, his Capriol Suite is still performed frequently to this day. In fact, you can hear the Parker Symphony Orchestra perform it on February 23. Impressionism is a term most familiar to fans of late 19th century painters such as Monet, Renoir, Cézanne, and Degas among other notable names. In fact, the term derives from Monet’s Impression, Sunrise. 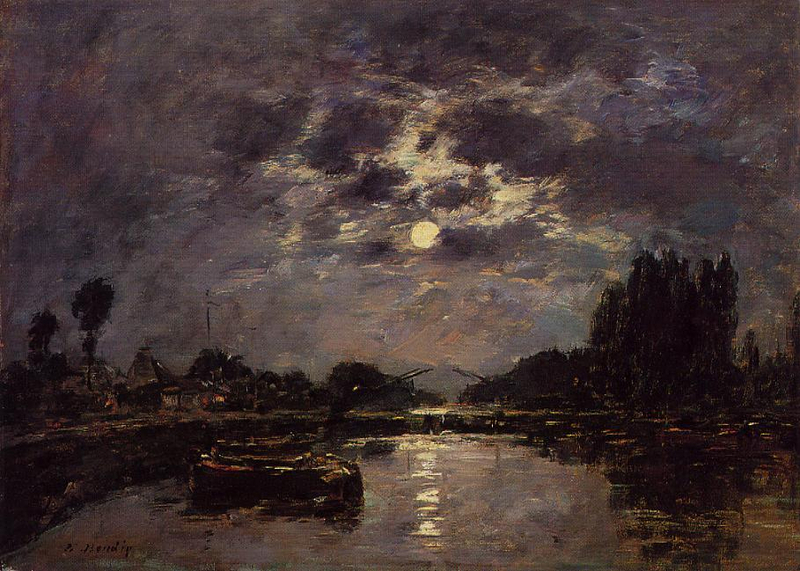 In general, impressionist painters focused on using visual brush strokes to paint overall visual effects and capture light and its changing qualities rather than focusing on details. They also tended to paint en plein air rather than in the studio. Impressionist paintings depict experiences, moods, and movement. Similarly, Impressionist music also conveys moods, scenes, and emotions rather than detailed stories. This style of classical music was written around the same time (late 19th century) and uses “color” or timbre through different textures, harmonics, and orchestrations to arouse feelings and create atmosphere. Interestingly, while he is often referred to as Impressionist, Debussy rejected the label. Even Ravel was uncomfortable with the name saying it could not be accurately applied to music. Impressionist music often has an evocative title. For example, Debussy’s Clair de lune or “Moonlight”. While it is actually the third movement of a larger work known as Suite bergamasque, the piece is more famous on its own performed in its original form by solo piano or adapted for orchestra. And when you hear its lush melodies and dramatic ebbs and flows, it’s not hard to see why it is a great example of French Impressionism in music. Other Impressionist music titles include Debussy’s La Mer and Prelude to the Afternoon of a Faun, Sibelius’ The Swan of Tuonela, and Ravel’s Daphnis et Chloé. Hear Clair de lune and other nature-inspired music performed alongside beautiful Plein Air paintings at the Parker Symphony Orchestra’s next concert, Friday May 5 at 7:30 PM at the PACE Center. Depending on the instrument you play or your passion for classical music, you may have heard the works of one or a few female composers. Pianists, for example, may know of or even have played Clara Schumann. However, the vast majority of the world has never heard of the likes of Amy Beach, Fanny Mendelssohn, or Florence Price, and that is quite unfortunate. Women have actually made significant contributions to the classical music world. However, they remain on unequal footing with their male counterparts. So for International Women’s Day, here’s a look at some notable and some forgotten women composers throughout history. 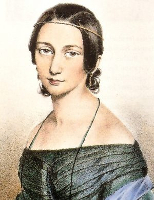 Clara Schumann (1819-1896) was not only the wife of composer Robert Schumann, but also one of the most distinguished pianists of the Romantic era. Her career began at a young age. At age 11, she went on a concert tour of various European cities and gave her first solo concert in Leipzig. Later, during her marriage to Robert, she met Johannes Brahms and not only helped encourage his career, but also was the first to perform publicly any Brahms work. She premiered several of his works during her career including the Variations and Fugue on a Theme by Handel. She also began composing at a young age. In fact, she wrote her piano concerto when she was just fourteen and performed it at age sixteen (with Mendelssohn conducting). As she grew older and focused on other responsibilities, she found it difficult to find time to compose. Her output decreased greatly when she reached 36 years old. Her works include piano pieces, the aforementioned piano concerto, a piano trio, choral pieces, songs, and three Romances for violin and piano. 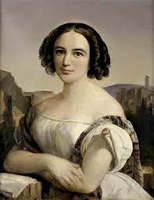 Like Clara Schumann, Fanny Mendelssohn (1805-1847) was a pianist and composer. She was Felix Mendelssohn’s sister and the pair shared a deep love of music. Felix arranged to have some of Fanny’s songs published under his name, due to prevailing attitudes toward women publishing music, which actually led to an embarrassing moment. Queen Victoria received Felix at Buckingham Palace and expressed her intention of singing her favorite of his songs. He confessed it was actually by Fanny. Fanny Mendelssohn was very prolific. She composed over 460 pieces including a piano trio, books of piano solo pieces and songs, and a cycle of pieces depicting the months of the year titled Das Jahr. This last work was written on colored sheets of paper with illustrations by her husband, Wilhelm. Fanny passed away after suffering a stroke while rehearsing one of her brother Felix’s oratorios. Felix completed his String Quartet No. 6 in F minor in memory of her. 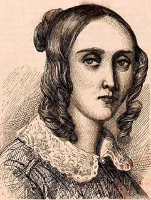 Louise Farrenc (1804-1875) is undoubtedly France’s first female composer. Born into a family of sculptors, she showed early talent in music and studied under such masters as Ignaz Moscheles and Johann Hummel. She married a flute student and together they gave concerts throughout France. The couple opened a publishing house together, Éditions Farrenc, which became one of France’s leading music publishers for 40 years. 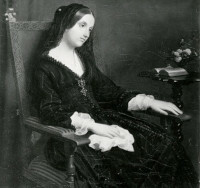 Like other female composers around her time, she was a pianist from a young age and wrote many works for the instrument. However, while she wrote exclusively for piano until 1830, she expanded her range and wrote works for orchestra starting in 1834. She wrote 3 symphonies, a wind sextet, vocal works, choral works, and chamber music in addition to music for piano. Unlike Schumann and Mendelssohn, Farrenc’s works remained largely forgotten until the late 20th century during a surge in interest in women composers. In December 2013, Farrenc was the subject of the BBC Radio Three “Composer of the Week” program. 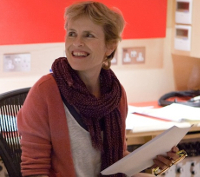 Rachel Portman (1960-present) is best known as a composer of film scores and, unlike our previous composers, is still writing today. She was born in Surrey, England and became interested in music at a young age. She started composing at the age of 14 and subsequently studied music at Worcester College, Oxford. During her time in school, she started experimenting with writing music for student films and theater productions. After that, she wrote music for drama in BBC and Channel 4 films. Since then, she has written over 100 scores for film, TV, and theater including The Legend of Bagger Vance, Mona Lisa Smile, Emma, Benny and Joon, The Lake House, Oliver Twist, and The Duchess. Her most famous soundtrack compositions are for the movies Chocolat and The Cider House Rules which was used in the Pure Michigan commercials. Rachel Portman was the first female composer to win an Academy Award for Best Musical or Comedy Score. She won for Emma in 1996. She has also won a Primetime Emmy Award for her work on Bessie. 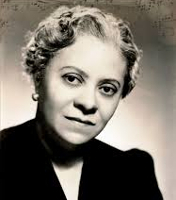 Florence Price (1887-1953) was not only a female composer, but also the first African American woman to be recognized as a symphonic composer and the first to have a composition played by a major orchestra. Born in Little Rock, Arkansas, her mother was a music teacher who guided her early musical training. She had her first piano performance at the age of four and published her first composition at the age of 11. After graduating high school at 14, she enrolled in the New England Conservatory of Music. She graduated with honors in 1906. After college, she moved back to Little Rock and was married. They moved to Chicago after a series of racial incidents. It was in Chicago where Florence entered her most fulfilling period of composition. She studied composition, orchestration, and organ with leading teachers and published four pieces for piano. Unfortunately, financial struggles led to a divorce and Florence became a single mother. To pay the bills, she worked as an organist for silent films and composed songs for radio ads (under a pen name). She submitted compositions for Wanamaker Foundation Awards and won first prize with her Symphony in E minor. The Chicago Symphony Orchestra premiered the symphony in 1933, making it the first composition by an African-American woman to be played by a major orchestra. Florence Price’s music incorporates elements of African-American spirituals, Southern themes, and inspiration from blues, African-American church music, and modern urban sounds. 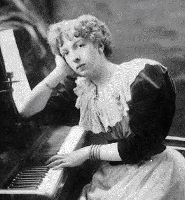 Amy Beach (1867-1944) was also a pianist as well as a composer. She is considered the first successful American female composer of art music. She was born a prodigy, able to sing 40 songs accurately by age one. She learned to sing counter-melody to her mother’s singing at age 2 and by age 3, she was reading. She composed simple waltzes at age 5. At age 14, Amy received a year of formal training in composition. Her performance debut was when she was 16. She played until she was married at which time she agreed to limit her performance to two public recitals per year. She devoted herself to composition. However, her husband disapproved of her studying composition with a teacher. So other than her one year of formal training at 14, she was a self-taught composer. She collected every book she could find on theory, composition, and orchestration. Her first success as a composer came with the performance of her Mass in E-flat major by the Handel and Haydn Society orchestra. It was the first piece the group performed composed by a woman. After that, she wrote many other works including her Piano Concerto, which she premiered as soloist with the Boston Symphony, and the Gaelic Symphony. Her compositions include symphonic works, choral works, chamber music, solo piano music, and songs (of which she wrote about 150). Cécile Chaminade (1857-1944) was a female composer in France whose music was largely financially successful. Born in Paris, she studied music with her mother at first and then piano, violin, and music composition later with other notable names. She began composing at a young age and when she was eight years old, she played some of her music for Georges Bizet who was impressed. Cécile wrote character pieces for piano and salon songs – all of which were published. Many of her piano compositions received good reviews from critics and were favorites in Europe and America. In fact, when she traveled to the United States in 1908, she discovered that her Scarf Dance and the Ballet No. 1 were in the music libraries of many piano music lovers. Other notable compositions include her Concertstück in C sharp minor for piano and orchestra, ballet music for Callirhoë, and her Flute Concertino in D major. The latter remains one of the most popular of her works performed today. In 1913, she was awarded the Légion d’Honneur, a first for a female composer. 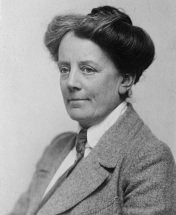 Dame Ethel Mary Smyth (1858-1944) was the first female composer to be awarded a damehood. In spite of her father’s protests, she studied composition at Leipzig Conservatory where she met notable other composers like Dvořák, Grieg, Tchaikovsky, Clara Schumann, and Brahms. She went on to composer 6 operas and numerous choral and orchestral works and songs. Unfortunately, her composing career was cut short by hearing loss. She was completely deaf after 1913. Recognition for Smyth came late. Her opera The Wreckers, though considered the “most important English opera composed during the period between Purcell and Britten”, wasn’t even performed in the US until 2007. Contemporary critics noted that her music was too masculine for a “lady composer”, as critics called her. Still, she received damehood in 1922 and several honorary doctorates for her composing. Deafness didn’t stop Smyth completely. Although she stopped composing, she joined the suffrage movement and published ten highly successful, mostly autobiographical, books. Jennifer Higdon (1962-present) is an American composer of classical music. She is also probably the most award-winning composer on this list. In 2010, she won the Pulitzer Prize for Music for her Violin Concerto with the note that it is “a deeply engaging piece that combines flowing lyricism with dazzling virtuosity”. She has two Grammy Awards for Best Contemporary Classical Composition – one for her Percussion Concerto and the second for her Viola Concerto. An album of her music, Higdon: All Things Majestic, Viola Concerto, and Oboe Concerto, won the 2018 Grammy for Best Classical Compendium. Higdon has received commissions from major symphonies including the Philadelphia Orchestra, the Cleveland Orchestra, the Chicago Symphony, and the Atlanta Symphony among others. Her works to date include an opera Cold Mountain premiered by The Santa Fe Opera, numerous chamber works for a variety of instruments, vocal compositions, and orchestral pieces including blue cathedral featured below. blue cathedral was commissioned by the Curtis Institute of Music in 1999 and is one of her most performed works. We realize there are many other women we could list here. Follow the links below for more information on these and other women composers. 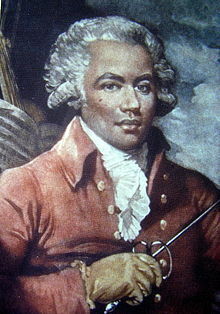 Name: Joseph Bologne, Chevalier de Saint-Georges. His family name is often misspelled as “Boulogne”. He is sometimes referred to as “The Black Mozart”. Occupations: Composer, champion fencer, virtuoso violinist, and conductor of the Concert des Amateurs, a leading symphony in Paris. Was also a colonel in the French Revolution. Other Interests: Dancing and ladies. He was a fine dancer, being invited to numerous balls and salons (and boudoirs) of highborn ladies. Compositions: 3 sets of string quartets, 2 symphonies, 8 symphonie-concertantes, 6 operas comiques, three violin sonatas, 14 violin concertos, a sonata for harp and flute, a bassoon concerto, a clarinet concerto, a cello concerto, six violin duos, and a number of songs. He is best remembered as the first classical composer of African ancestry. His father was a wealthy planter on the Caribbean island of Guadeloupe and his mother was an African slave. He was born on the island and moved to France as an early teenager. Upon graduation from the Académie royale polytechnique des armes et de ‘l’équitation (fencing and horsemanship), he was made an officer of the king’s bodyguard which is where he acquired the title Chevalier de Saint-Georges. He was such an amazing fencer that he was called “the god of arms”. At the age of 19, he had only suffered one defeat in a serious fencing match. Not much is known of his early music training although several works were dedicated to or written for him including two Lolli concertos and Gossec’s six string trios. His first composition is a set of six string quartets inspired by Haydn. He was a skilled violinist, but he also played the harpsichord. He was an early Black Mason. He conducted the Concert des Amateurs, a top Paris orchestra, for years, but after the American Revolution, the organization suffered financial losses. The Masons helped him revive the orchestra as part of the Loge Olympique, renamed Le Concert Olympique, which was an exclusive Freemason Lodge. He became fascinated by the stage, abandoning writing instrumental music in favor of opera around 1776. However, he suffered a serious setback when his nomination to be the next director of the Paris Opera was halted by a petition from three of its leading ladies. To avoid embarrassing the Queen, Marie-Antoinette, he withdrew his name. He went on to write operas and direct the Marquise de Montesson’s prestigious musical theater instead. He volunteered to serve during the French Revolution. He joined the Garde Nationale, but even his duties couldn’t prevent him from giving concerts. He built an orchestra and reportedly gave concerts every week. In 1794, he became colonel of the first cavalry brigade of “men of color” – the St. Georges’ Legion – which was also the first all black regiment in Europe. He lead 1,000 volunteers of color and halted what became known as “The Treason of Dumouriez”. He was wrongfully imprisoned for 11 months and threatened with execution after returning from military duties in Sant-Domingue (now Haiti). He was released and lived in semi-retirement, unfortunately with health problems. He did, however, become even more devoted to his violin during this time saying, “Never before did I play it so well”. He died in 1799 in Paris aged 53. President John Adams called him, “the most accomplished man in Europe”. Below are some of his compositions you can listen to today. Finlandia, one of Sibelius’ most famous compositions, is often referred to as a tone poem. A tone poem is a piece of orchestral music with only one movement that evokes a poem, story, painting, or other non-musical source. In the case of Finlandia, it was one of seven pieces that served as an accompaniment to a tableau that depicted episodes from Finnish history. It premiered July 2, 1900 in Helsinki. But it was much more than just a historical tribute. It was secretly a protest against censorship from the Russian Empire. Prior to 1917, the Grand Duchy of Finland belonged to the Russian Empire. Most of the piece features rousing music that is meant to evoke the national struggle of the Finnish people. After that, a serene melody can be heard. Named the Finlandia Hymn, this section is Sibelius’ own creation that was arranged later for solo performance. 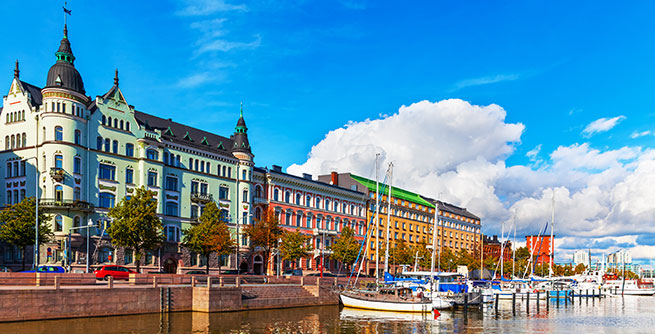 The hymn has become one of Finland’s most important national songs with words written for is in 1941. To avoid Russian censorship while protesting it, Finlandia was performed under alternative names. Some of these include Happy Feelings at the awakening of Finnish Spring and A Scandinavian Choral March. Finlandia can be heard prominently in the film score for Die Hard 2: Die Harder. It will also be performed by the Parker Symphony Orchestra on October 29. Purchase tickets here. Friendship comes in many forms. When it comes to your circle of friends, you may include everything from acquaintances to BFF’s. 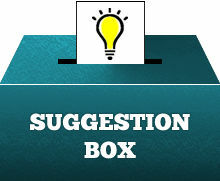 Or you may prefer something more intimate and keep your group limited to people you’ve known for years. Either way, friends play an important role in life. The same is also true for classical music composers. 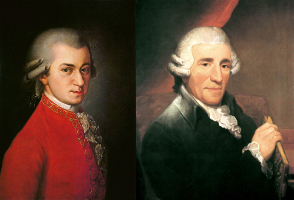 In fact, some of the most famous composers, like Mozart and Haydn, were actually very close friends who inspired and challenged each other to reach new musical heights. Since today, June 8, is National Best Friend Day, we’re going to profile just a few of these classical music composer friendships. Though he was far younger than Haydn, Mozart’s relationship with Haydn was one of mutual respect. They most likely first met in 1781 when Mozart moved to Vienna. Haydn was already a famous composer and Mozart’s reputation was on the rise. It is not well-documented, but they appear to have been friends that enjoyed each other’s company and work. Some music suggests that Haydn may have been somewhat of a mentor to Mozart. Haydn freely praised Mozart, once saying, “I have often been flattered by my friends with having some genius, but he was much my superior.” Mozart was documented as speaking very highly of Haydn. Mozart even wrote a series of string quartets dedicated to Haydn. Haydn was distraught over Mozart’s death. He wrote, “for some time I was quite beside myself over his death, and could not believe that Providence should so quickly have called away an irreplaceable man into the next world.” Haydn also wrote to Constanze Mozart, the widow, offering musical instruction to her son when he reached the appropriate age, and later followed through on his offer. 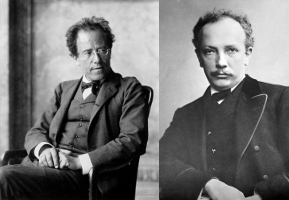 It is said that upon Mahler’s death, Strauss was so devastated that he could barely speak. He considered Mahler a good friend and worthy adversary. At Holst’s funeral in 1934, Vaughan Williams conducted music by Holst and himself. 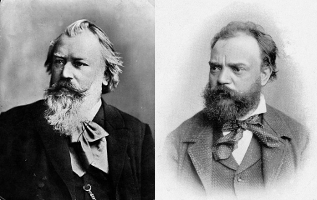 The friendship between Brahms and Dvořák is actually quite an unlikely one. Brahms was not known as particularly encouraging of young and new talent. A couple of composers even became obsessed with his lack of appreciation for their work. In 1874, however, he reluctantly sat on a jury to award financial support to talented composers in need. He encountered a submission from an obscure Czech composer including two symphonies, several overtures, and a song cycle. He was reportedly “visibly overcome” by the “mastery and talent” of the individual who we would learn was Dvořák. He arranged for Dvořák’s work to be given to his own publisher, Simrock, who accepted it and even commissioned what became one of Dvořák’s most popular works, the Slavonic Dances. 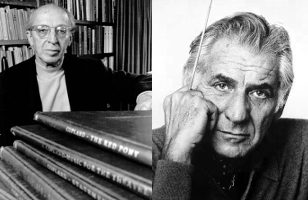 While Holst and Vaughan Williams were well-known in England, there was also a musical friendship of two greats in America – that of Aaron Copland and Leonard Bernstein. The two met in November 1937 on Copland’s birthday and remained friends for almost half a century. Copland was already an established composer. Bernstein recalled many years later in an article that he “was crazy about” Copland’s Piano Variations and when he was introduced to him at a dance recital in New York, he “almost fell out of the balcony”. Copland was extremely influential on Bernstein’s career. He often offered constructive criticism for Bernstein’s music and even helped him get started in conducting studies, writing him letters of recommendation and guiding him to Curtis Institute. Copland, however, was less enthusiastic about Bernstein’s music than his role as a conductor and Bernstein was sharply critical about Copland’s music (particular his Third Symphony). Still, their friendship remained overwhelmingly positive. The two spent many summers together at Tanglewood, the summer home of the Boston Symphony, and Copland’s rhythmic freshness and recognizable American style can be seen in some of Bernstein’s work. Coffee and classical music have a lot of obvious similarities. They can be smooth at times, robust at others. There are connoisseurs of each and some of both. 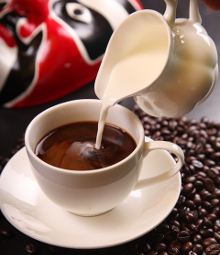 You might even listen to classical music while enjoying a latte or café au lait. There are, however, other connections between these two worlds that may not be as well known, but are certainly more fascinating. Here are some our favorites. Bach wrote a Coffee Cantata: J.S. Bach often held concerts at his favorite coffee house in Leipzig, “Zimmerman’s Coffee House”. During this time, he wrote a mini comic opera or dramma per musica called Schweigt stille, plaudert nicht (Be still, stop chattering) featuring a character addicted to coffee. It has come to be known as the Coffee Cantata. Beethoven was a coffee fiend: Beethoven started each day by drinking a cup of coffee brewed using exactly 60 coffee beans. Why 60? Some people who have studied the man theorize that Beethoven believed this to be the number required for the perfect cup of coffee. For reference, a cup of modern coffee contains 10 beans or less. Beethoven certainly enjoyed his joe on the much stronger side. Glenn Gould drank gallons: Glenn Gould was more than just one of the most celebrated classical pianists of the 20th century. The Canadian was also a bit of an eccentric described as drinking “gallons of coffee”. Of course that could be because he enjoyed a “very nocturnal sort of existence” scheduling many of his errands at the latest hour possible – a lifestyle he described in a 1979 television documentary. Mozart preferred his coffee black: About two months before he died, Mozart wrote to his wife about playing billiards after which he ordered black coffee and smoked a “wonderful pipe of tobacco”. Coffee even makes an appearance in Don Giovanni. There’s a classical music themed coffeehouse in Portland, Oregon: The Rimsky-Korsakoffee House in Portland is a classical-music themed cafe in an old Craftsman-style house. One of the city’s first coffeehouses, it serves coffee and desserts and has hosted classical music events. Learn more about it on Wikipedia. Rossini noticed that coffee’s effects wore off after constant use: A lover of many foods, Gioacchino Rossini was quoted as saying, “Coffee is a matter of fifteen or twenty days: luckily the time to make an opera”. Many Viennese cafes frequented by famous composers are still standing: Café Landtmann, for example was established in 1873 and was a hangout for Gustav Mahler. Anton Bruckner frequented Hotel Imperial. Mozart reportedly liked Cafe Frauenhuber. Cafe Dommayer was the site of Johann Strauss Jr.’s first performance where he and his orchestra were an instant hit.